This year in September took place the 5th edition of the now renowned BIWA (Best Italian Wine Awards) where a jury of 10 Worldwide wine experts have voted for the 50 best Italian wines within a group of 300. Remarkably, 5 of the top 20 places have been occupied by 5 wineries promoted and sold in Ireland by A Taste of Italy. In fact in the 3rd place we found Tenuta San Guido, a Tuscan winery became famous worldwide for their top class Super Tuscan Sassicaia and Guidalberto. The prize has been reached with the glorious Sassicaia D.O.C. 2013 that we are now selling. Experts said this was a very fine year, potentially the most significant since 2006, and one that will require considerable patience. 2013 is clearly an year destined for greatness and It will shape up to be an epic release for this celebrated wine. 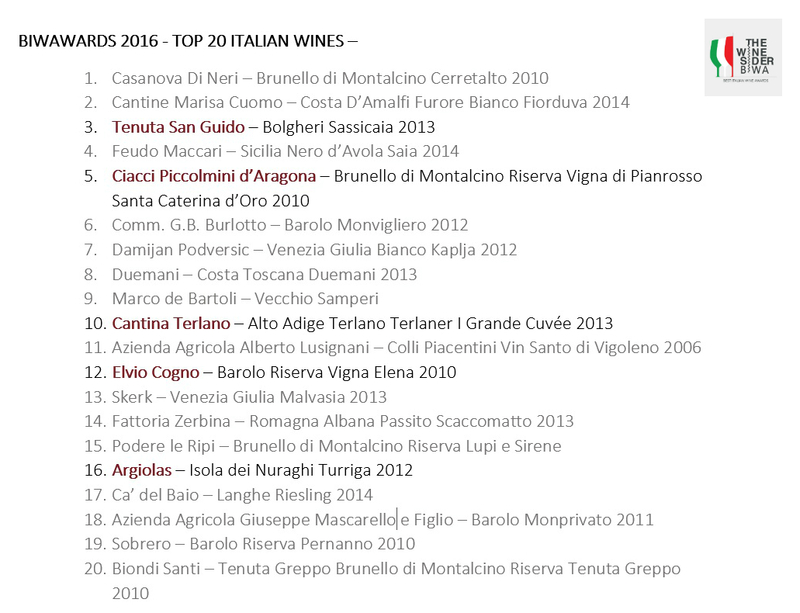 In the 5th place there is Ciacci Piccolomini d’Aragona with their Brunello di Montalcino Riserva Vigna di Pianrosso Santa Caterina d’Oro 2010. Another great Tuscan red wine which might not have the same known of the Sassicaia but which still represent the heart and the savour of the Tuscan land. 10th place for Cantina Terlan in Trentino South-Tyrol region in the very north of Italy. This vinery is mostly known for the longevity of their white wines. The persistence of their white wines during time is something unique and it is achievable only through real passion and great effort. 12th place for Elvio Cogno, a producer of the Langhe area in Piedmont, in the north west of Italy. The Barolo Riserva Vigna Elena 2010 won the prize. Same vintage of our fabulous Barolo Ravera DOCG. 16th place finally for our winery Argiolas , in Sardinia isle. From this land we import the Costamolino Vermentino and the Costera Cannonau. Two great wines that got their names from the local vine Vermentino and Cannonau. You can find the whole stories of these wineries and others in the producer page of our website.